Football season is over, I'm a [not so] solid ten pounds heavier than last summer, and I've eaten enough junk/dine-out food to last me a decade. I looked at Pinterest for healthy things and went straight to the grocery store. I'm a huge fan of all fruit and most vegetables, so it's not hard for me to eat healthy, but I do like to switch things up. 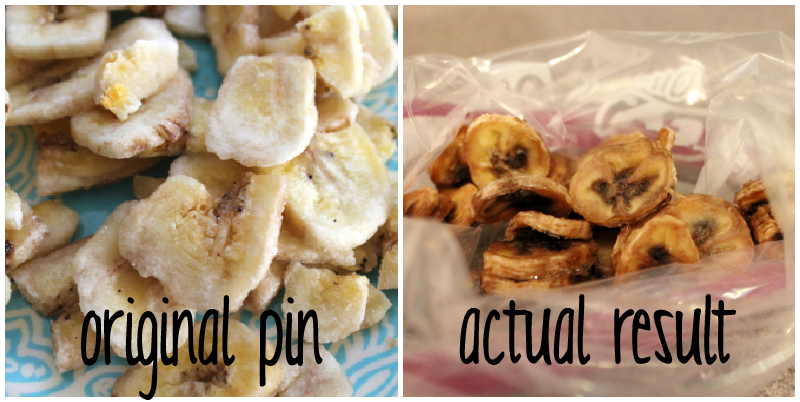 The banana chips pin looked like they came straight out of a dried fruit bag and seemed simple so I tried it. When I first pulled them out of the oven, I'm not going to lie to you, I damn near took them straight to the trash. They were so brown and unappealing, and really not that dry. I tried them anyway, and they were good! I just couldn't look at them while I picked them out. The longer they sit out afterwards, the dryer they'll get. They say the riper the banana, the sweeter they'll taste, and as far as I can tell, that's true. I also saw some variations where you sprinkle cinnamon [without sugar] on them, or drizzle chocolate for a dessert. I will definitely be trying the cinnamon next time. I'll probably be filling you in on lots of Pinspired recipes I try, if they come out differently than I imagined. If not, I'll inform you on Twitter how delicious they were.